One may attribute this type of music to prison-era Burzum where he sought out old casio keyboards with murder fresh on his breath. When one is in prison, imagined or real, escape by any means necessary is inevitable. With Rise…, we get a glimpse of the project’s focus with a lengthy narrative about a bad man. These songs are the specter’s songs, they are his soundtrack. Sure, it’s a little silly, but I have a deep respect for artists who are willing to put themselves out there and Old Tower goes in all the way. If you’re jaded like me, it’s still very easy to appreciate the scope and nature of this project. Both sides of the tape feature very rich sounds which often consist of human voice and strings nestled tightly around a lower register sound, usually drums or a bass rumble. Old Tower immerses you neck first very quickly into his world as the sounds are thoughtfully laid out. 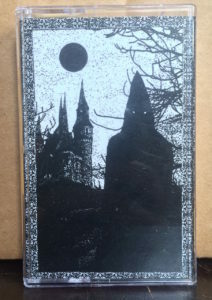 Dungeon synth perhaps may be no more than a particular flavor of dark ambient, but the black metal trappings that adorn this project are pretty obvious as is the fantasy element. If you like the more serious melodies from Skyrim, LOTR movies, or virtually any other fantasy escapade, you’re going to dig this. I suspect that this project is the cream of the crop for the new wave of dungeon synth dorks.